After my internship in Hong Kong, I wanted to go for a well deserved break to Japan. My first choice was to visit Tokyo. Because I was not too familiar with Tokyo, I went to several travel agencies in Hong Kong beforehand and got some advice. The packages with plane tickets and hotel can be cheaper than offers online, so be sure to compare the prices. If you are staying in the Hong Kong Island area, I recommend going to the Hang Lung centre in Causeway bay. Located on Paterson street, the building houses many of the big travel agencies and also smaller ones on the 6th and the 7th floor. After looking through a lot of brochures I received from multiple travel agencies and after comparing the prices, I decided on the package that included a plane ticket with the ANA airlines and a few days stay at the Hilton hotel in Shinjuku. When I arrived at the Haneda airport, I took the Airport limousine bus at Terminal 1, which takes me directly to the hotel for 1200 yen. The waiting time varies from 40 minutes to an hour and there are no benches outside to sit and wait, so it is better to have a coffee or a snack at one of the eateries in the airport and wait there until it is about time to get on the bus. The trip to the hotel takes about 20 minutes and stops at other hotels on the way. You can also take the airport train to Shinjuku station and take the free shuttle bus there to reach the hotel. I booked a triple guest room with a very nice view on the 17th floor. The room was more than large enough for three people. The glass windows in the room have traditional Japanese, sliding doors covering them, which is an interesting detail. The room also comes with Japanese yukatas instead of the western bathrobes. The bath products that can be found in the large bathroom with bathtub are from Crabtree and Evelyn. I have noticed that the bath supplies in Japanese hotels are always very complete. In every hotel I stayed at in Japan, I could find a razor set, shampoo, conditioner, small soaps, shower gel, hairbands, shower caps, and a comb in the bathroom. What I did not like about the hotel is that it costs me 1600 yen to get a one day worth of Internet connection in the room. This is really annoying since I cannot pay per hour and the time I spend online per day is very little, since I am outside, sightseeing most of the day. I can also not save up the hours that I didn't use for the next day. So basically, I paid 1600 yen for two hours of Internet. The hotel also provides free shuttle buses from and to the Shinjuku station. The shuttle bus from the Hilton Tokyo hotel to Shinjuku station runs from 08:12 to 21:52 and three times an hour on the 12, 32 and 52 minutes mark. The shuttle bus from the Shinjuku station, located at bus stop number 21 in front of the Keio Department Store, runs from 08:20 to 21:40 and on the 0, 20 and 40 minutes mark of every hour. The bus only arrive once every 20 minutes, so when you have just missed it or when the capacity of 43 passengers is filled, you can also walk. The hotel is only a 15 minute walk from the hotel to Shinjuku station. Initially, I didn't think a 15 minute walk between the hotel and the station was that bad. But looking back, I think it is better to stay in a hotel closer to the station. It can get very tiring to always have to walk that far to buy something to eat or to go somewhere else using the metro. Taking the shuttle bus didn't make much of a difference, as it seems to take just as much time (when you include the waiting, boarding and exiting time). Also, you can find a lot of stores and restaurants at the Shinjuku station, so it is a lot more convenient in comparison with the surroundings of the Hilton hotel, which seems to be a quiet area with mainly office buildings. On the right of the hotel, you can find a Wendy's. You need to take the metal stairs up at the building across the street to reach the entrance of that family restaurant. The sandwiches there were quite delicious, I think it was about 500 yen for two small club sandwiches. On the left of the hotel, there are more restaurants located in the underground area. One of them is the Burger King. Why do I keep finding American fast food places, when I want to eat delicious authentic Japanese food? >_< Do try to go through the rack of flyers, which you can find right at the glass doors to the underground area. It sometimes has coupons for one of the restaurants. You can also take the underground tunnel there to directly walk to the Shinjuku station. The first time, I walked above ground from the hotel to the station. It was very tiring and I also felt lost most of the time. To make things worse, I was feeling very hungry, as I didn't eat anything since waking up in the morning. But when you go through the underground tunnel, you can at least get a piece of bread from one of the bakeries to eat as breakfast and you can look around at what the many stores are selling, instead of looking at grey office buildings the whole time. There are also clear signs showing you which direction to go, so you cannot get lost either. 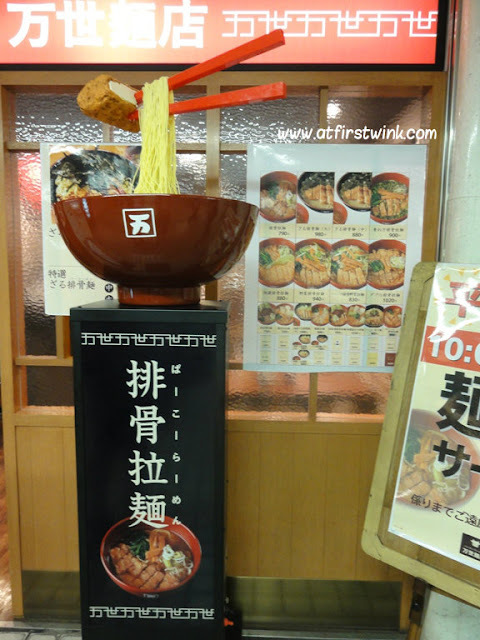 Ramen shop in Shinjuku station with a large ramen bowl in the front with moving chopsticks and smoke coming out of the bowl.